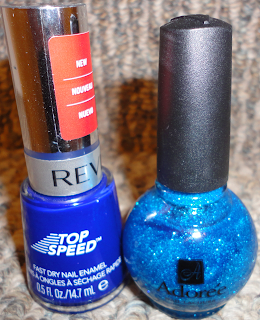 Tuesday nights are usually my 'it's time to get down to business and paint your nails!' night, but, I do have to work the next day (aka today). I worked on filming a tutorial last night. Then, once I was done that and had nothing on my nails again, I felt.. sad? So. I did my nails anyways. And now I'm still upset because they will be ruined today. It is extremely simple, but, in my mind, effective. I used two coats of Revlon Royal. I caved. I have seen these polish swatched in so many places! I had to have it! And, I'm happy I do. I love it!! Then, of course, I was bored. I grabbed Adoree Seaport Blue and sponged that on the tips. I should have left it, but I wanted to add something to it. I grabbed konad image plate m77 along with the white polish and added bows. I couldn't stop there though. 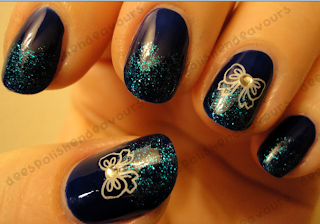 I added in some silver rhinestones to the middle of the bows. Perfect. I really like this mani. Sadly, it will be ruined today. Oh well, at least its memory is now captured in photos. Enjoy!! Have a great day everyone! I better go pack some polish with me.. I am going on an overnight adventure.. My sister is housesitting, but has to go back to work tomorrow.. So we'll switch and I'll stay and watch the home (and adorable pets!) til the owners get back!! (Yaz you lucky magoo!) - Take care!! Very nice in both the strong light and low light conditions. It looks like a bit of magic in the low light photo!